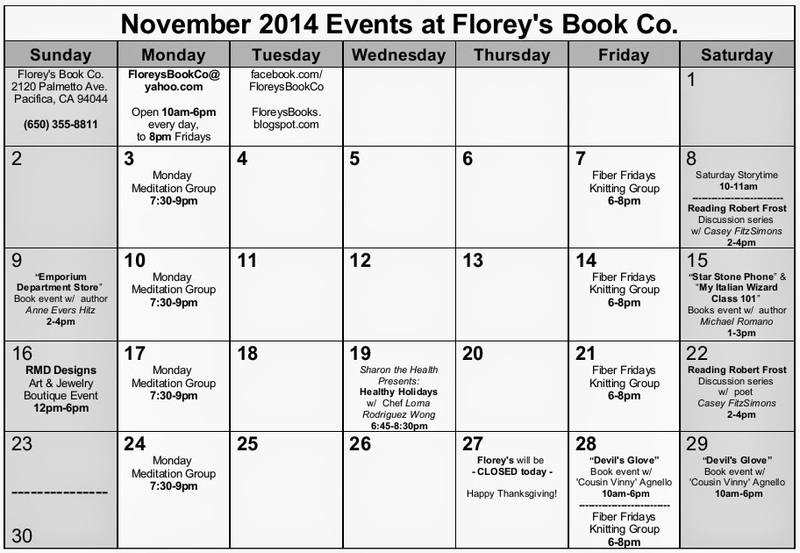 November 2014 Events at Florey's Book Co. 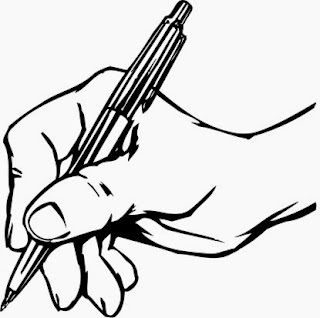 Develop your powers of poetic interpretation. Call (650)224-9857 for more information. A new photo history of the beloved San Francisco store. -"Star Stone Phone" & "My Italian Wizard Class 101"
Dual book release event with author Michael Romano. -November 27th, Florey's will be CLOSED. 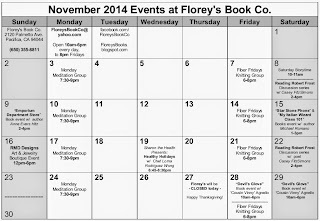 October 2014 Poetry at Florey's! The time has almost arrived for our last poetry reading for this season at Florey's (we resume in January 2015). I want to invite you to join us for what is usually an exceptionally lively and enjoyable evening. Our two featured poets, Terri Glass and Claire Blotter, will share their artistry with us; their styles nicely complement and enhance one another, and will take us to some interesting places. 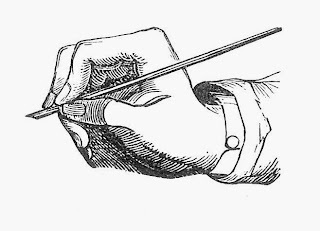 As always, we invite you to read your own poetry, or a favorite poet's, at open mic; you can also come to lend your ear to others. Poetry does not live and breathe without an audience. Bring a snack or beverage to share, if you can; there are rumors that the famous castle cake will be on the table! There are two unusual elements for this evening. The first is what I detailed for you in the earlier announcement. We will have more than three dozen framed works of art displayed in the store for your perusal. They will be nominally priced, and if you choose to purchase one, your contribution will be added to others, and sent to Bill Burruss, former owner of Know Knew Books in Los Altos. Bill has long been a friend to literature, poetry and all the arts, as well as to Bob and me during the two years we hosted a poetry series at Know Knew. The loss of his store to an unscrupulous business partner meant the loss of his livelihood, and he and his wife have been forced to leave the area. If you don't want to buy a piece of art, you can make a contribution of any size, and will be part of the message that others care about what has happened to him. One note about the art: these works are not in pristine condition, though some are quite fine. They are pre-loved; some of them, very well indeed! Bob and I have cleaned them up completely so they will put their best faces forward, and we hope you will come a little early to take a look. The collection is a very interesting one, and perhaps you will find something that resonates for you! As well, I wanted to let you know that copies of my friend, Anne Benvenuti's book, Spirit Unleashed: Reimagining Human-Animal Relations (containing my poem "Wild Healing") will be available for purchase. The book has been nominated for the Pulitzer Prize, and is a timely and thought-provoking work. If you don't know about it, I invite you to take a look. I appreciate your patience with all this, and hope to see you on Saturday! "What's it Like Being Dyslexic?" Talk with Gina Mazzetti At Florey's! Many people are under the impression Dyslexi a simply affects a person while they are in school; however, the affects of dyslexia cont1nue beyond academia. Gina will discuss what a dyslexic can potentially experience in school, in the workplace, as well as how the condition can ultimately affect a person’s entire life. 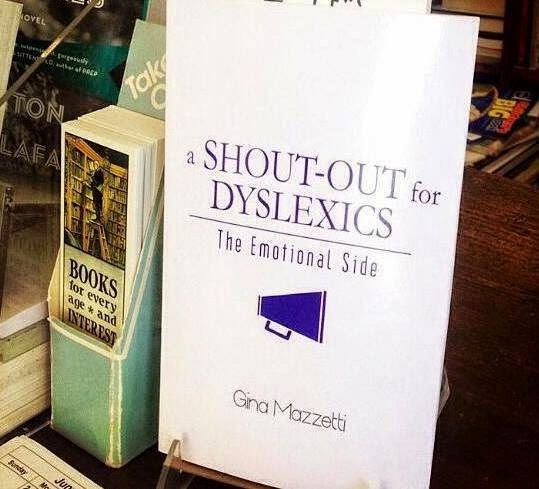 Additionally, Gina will present tips on how dyslexics can face, manage, and embrace their learning disability. Join Gina at 2-4pm at Florey’s Book Co, in Pacifica, CA and be a part of the empowering, emotional, and necessary conversation! "Cancer: My Teacher, My Healer" Book Event with Author Manuela Sherman, October 18th at Florey's! 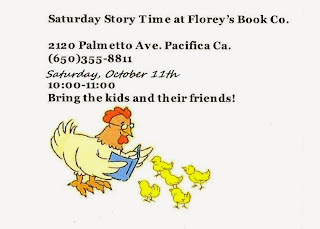 Florey's Books welcomes Pacifica author Manuela Sherman as she discusses her new book "Cancer: My Teacher, My Healer". Manuela Sherman shifts a breast cancer d1agnosis into a healing journey. 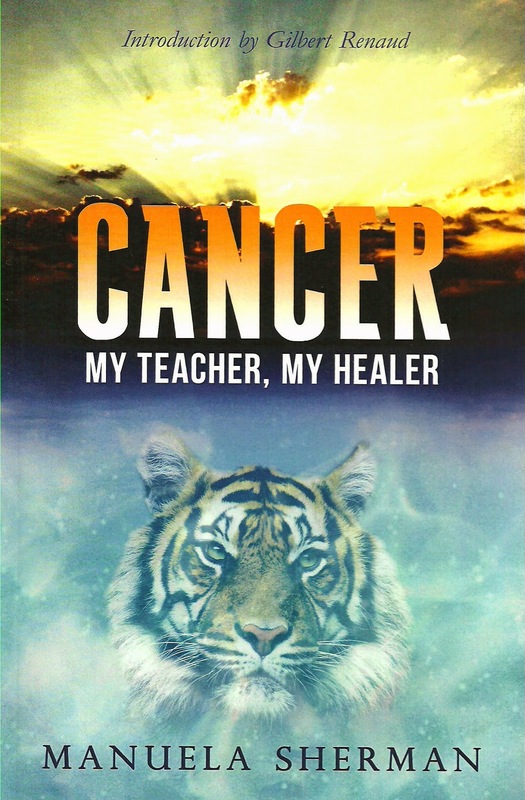 In "CANCER: My Teacher, My Healer", she sh0ws us how healing an illness is directly related to uncovering the cause of that illness. Using her own biography and Recall Healing, Manuela describes all the elements she used to heal her cancer. Through this process her cancer became the most profound teacher of her life as she transformed a life-threatening illness into a deeply spiritual experience. Manuela Sherman discovered how to heal herself--and these secrets she shares with you in "CANCER: My Teacher, My Healer". Manuela Sherman was born in Madrid, Spain in 1949. She was born with a he@rt defect which impacted her health throughout her life thus she was no stranger to illness. But when she was diagnosed with cancer at age 61 in 2011, she began to discover a process of healing that was previously unimaginable. Not only did she learn how to heal herself, she learned the secret to the true nature of the healing process which she shares in this book. 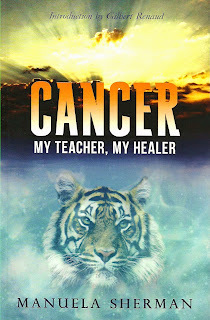 "CANCER: My Teacher, My Healer" is her first book. Pacifica Writers Forum, October 16th at Florey's! 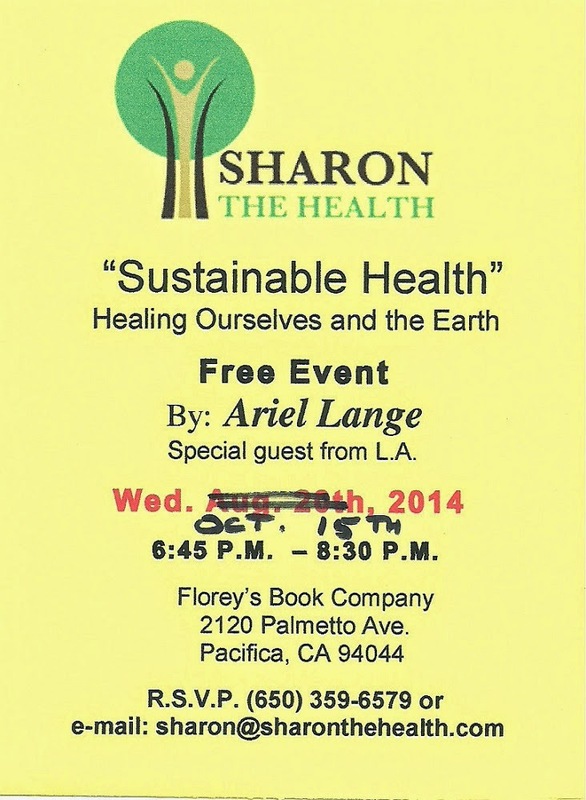 Sharon the Health Presents: "Sustainable Health" w/ Guest Ariel Lange, Oct. 15th at Florey's! 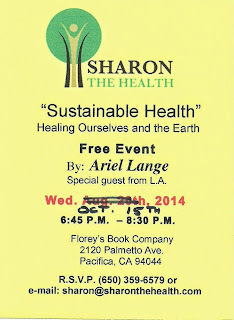 Florey's Book Co. welcomes Sharon Caren and guest speaker Ariel Lange. We are surrounded by an onslaught of toxic chemicals that disrupt our hormones, shut down our immune system, and create disease. Come check out first hand how natural, green products and therapeutic grade essential oils help to create healing for the planet. You will learn to eliminate toxic products from your life and contribute to a clean, healthy world...Your children will thank you for it! Take a stand and change your home and community. It's easy and fun! Bring your friends, family and neighbors....See you there!